Meanwhile, on the periphery of the Islamic world, there were a few other revolutions. Libya in 1969 saw the overthrow of yet another king by a left leaning military man. But Colonel Gaddafi was quite unlike Nasser and Assad and Abu Bakr/Saddam Hussein in that he was deeply religious. Coming into power in the year Nasser died, he became in the next decade the icon of the Arab world – which perhaps should have taught the West which way the wind was beginning to blow. But they had other distractions at this time. In Afghanistan you had had a variation on the Iranian theme, with a Marxist oriented government emerging in the early seventies through the strange semi-feudal political system the country had. That became fertile ground for intrigue and, fearing that the West had suborned some elements of the regime, which had always been riven by factionalism, the Russians marched in in the last days of 1979 to consolidate the control of their favoured Marxists. It was a move that arguably led to their total defeat in the Cold War, with the United States supporting a resistance movement that forced a Soviet withdrawal. 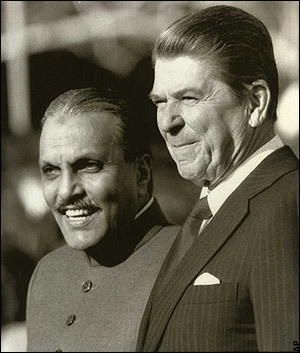 The Afghan invasion gave a new lease of life to General Zia ul Haq, who had initially got the cold shoulder. This was the period at which Jimmy Carter I think genuinely tried to inject some element of morality into international relations, but this phase did not last. What with the Soviet invasion of Afghanistan as well as other events in 1979, the solid self interest of Ronald Reagan seemed more desirable. Zia accordingly became flavor of the month. Since he was deeply religious, unusually so in Pakistan at the time for a military man, he was most supportive of the religious resistance to the Russians. Hence the Taliban. It was ironic that the West should have turned to religious fundamentalism at precisely this point, given that the revolution in Iran, the other significant transformation of 1979, had been religious in character. It was true that previously, in the Western oriented authoritarian regimes of the Middle East, religion had seemed a good counter to Marxism, but Iran showed that it could also be forcefully oppositional. However, at the height of the Cold War, with Russia seeming on the verge of securing itself in South Asia, the West was still concerned primarily to deal with Marxism. Indeed it was probably happy that the Shah’s ruthless extermination of the left in Iran had ensured that, when dissatisfaction proved too powerful to resist, there were no Socialists to inherit the country. The Ayatollah at that stage probably seemed a better bet than Marxists – and indeed later we were to see, in Contragate, that America still thought Marxism so dangerous that compromises with Islam were desirable in comparison. And there was another element in the Western view of things which is a prime example of the determination of people to believe what they want to believe. It was some years later, when Iran was clearly an enemy but the Taliban and others had succeeded in forcing the Soviets out of Afghanistan, that I was circling the world on the Semester at Sea programme run at the time by the University of Pittsburgh. I found it astonishing then that the American academics on board were convinced that Shiites were dangerous fundamentalists, whereas the Sunnis were basically moderate Christians with some slightly eccentric beliefs. I did suggest then, in 1990 I believe it was, that Saddam Hussein proved that such a sanguine view of things was erroneous, but I did not carry conviction. And so the West paved the way for the bitter hostilities we see today. I doubt however whether there are any regrets about the myopic view of looking at things in the past. What went wrong will be based on others, not the sheer lack of principle and informed intelligence on which international relations should be based, even when pursuing one’s own self interest.